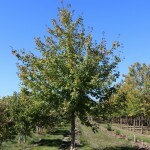 A slow growing maple, native to the Rocky Mountains, and related to sugar maples. The summer foliage is dark green, turning to orange in the fall. It will tolerate drought and alkaline soils. Prefers full sun. Grown both in tree and clump form.